Anyone can be a facilitator! You may be a mom who wants to show a KidCareCanada video to a friend or two. Or maybe you are a nurse training other nurses and using a KidCareCanada video. Or perhaps you are a senior academic or physician about to do a presentation. The KidCareCanada Learning Guides are ideal for anyone wanting to lead an interactive discussion or hold the attention of an audience. The guides are comprised of various resources that enable a novice or experienced facilitator to lead group learning or teach in a way that people retain the learning. You will find information about how adults learn, how to organize a session or a workshop and how to use a video to get people talking. We have created questions (and answers) for our “Born to Communicate” series of videos. Users from all over BC tell us that these are a great way to animate a parenting session. 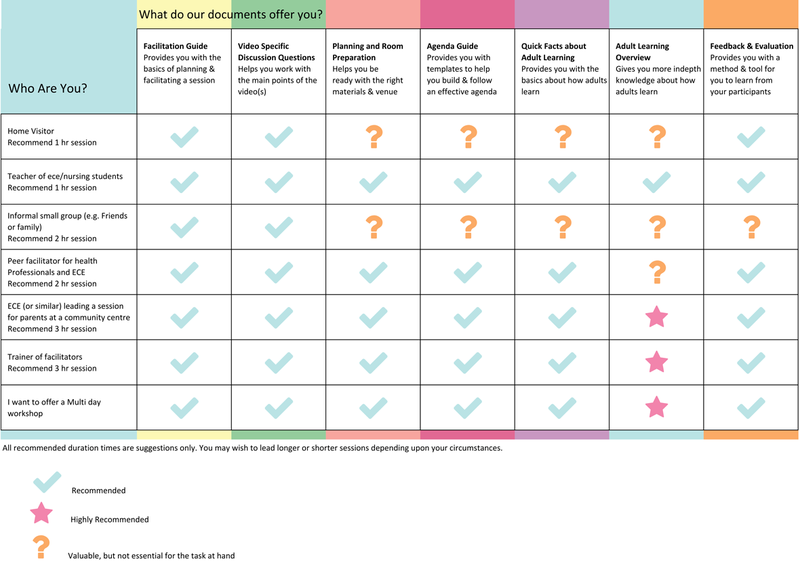 This grid helps you determine which documents are relevant to your needs.